1. Crush the cardamom pods using a pestle and mortar to release the seeds. Remove and discard the outer husks leaving behind the black seeds and crush a little more. Mix in a large bowl with the ginger, garlic, garam masala, chilli flakes, almonds and cream. 2. Cut the chicken into 2cm dice and add to the bowl, stirring well so all the pieces are coated in the marinade. Cover and chill for at least 4 hours or overnight. 3. 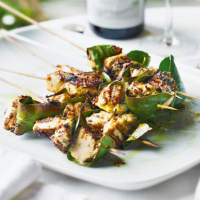 Stir in the salt and thread onto skewers (if you are using wooden skewers soak for 30 minutes before using), adding several bay leaves to each and spacing the pieces of chicken slightly apart so they cook through quickly. 4. Light the barbecue about 30 minutes before cooking to allow the flames to die down. Rest the chicken skewers on the barbecue and cook for 10–15 minutes, turning frequently until golden and cooked through with no pink meat. Serve with a dollop of natural yogurt, if you like.